Foreword from "Prophet For Our Times"
You are holding in your hands a book that I love, written by a Master whom I revere. I am honoured to say a few words in this collection of sayings and writings by the esteemed Peter Deunov in the English language. As I began to investigate the teachings of this man, I was exposed to a new way of looking at life, one in which the highest principle was something that Deunov called Divine Love. The more I studied the life of this man and his lifetime commitment to creating a world that lived by spiritual precepts and laws, the more I began to realize that this great man, who died when I was only four years of age, and who was born in 1864 while the American civil war raged on, was having a huge impact on my own life and teachings. I found his teaching slipping into my writing, my lectures all over the world and particularly in my own personal life as well. Peter Deunov explained to me via his translated lectures that there are three kinds of love. But the essence of the teachings of Peter Deunov are in his third category of love, that he called Divine Love. This is a love that never changes and never varies. This is the kind of love that our source of being has for us. This is the kind of love I am committed to cultivating within myself and all of my teachings as well. For many years I have given the example of the Orange – asking my audiences to imagine what happens when you squeeze an orange as hard as possible, and enquiring what will come out. The answer of course is that the only thing that can come out of an orange is orange juice, because that’s what’s inside. It doesn’t matter who does the squeezing, what the circumstances might be or anything else; when you squeeze an orange you get what’s inside. Then, I would ask my audience to see the metaphor here and become the orange. If someone squeezes you, that is, puts pressure on you, or behaves rudely to you or is outright angry towards you, what is it that comes out? It doesn’t matter who does the squeezing or what the circumstances might be, you get what’s inside. If there is anger, resentment, fear, hatred, stress or anything else inside, that is what will come out, and it has nothing to do with who does the squeezing, just like with the orange. Peter Deunov suggests that when we get to the stage of Divine Love, and that is all that we have inside of us, that is what will be on display. This is the kind of Love that great spiritual masters not only speak about, but that they live at all times – a love that never varies and never changes. It was in the reading of this man’s lifetime of spiritual instruction that I began to live each day from the perspective of the orange, that is, to be free of blame, judgment, criticism and condemnation towards any of God’s children. Deunov spoke passionately about the need to create a new man for a world desperately in need of transformation. This is how he described this phenomenon: ‘The new man who is now being created I call the man of light. Wherever he goes he illuminates things with the light he radiates . . . The new man is sustained only by positive thoughts and feelings. He lives in joy . . . He is the man of Truth and Freedom who has found himself . . . I pride myself in my efforts to live and teach as this new man. 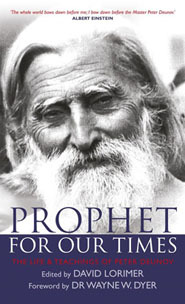 When I was just a child living in foster homes in America, Peter Deunov put his own unique spiritual understandings to work in a very practical way by playing a very critical role in saving the Bulgarian Jews from deportation by using his spiritual intuition, as David Lorimer explains in his Editor’s Note (see page xvii- xviii). The teachings of Peter Deunov are based on three main principles. Divine Wisdom, Divine Truth and especially Divine Love. He felt that the the True Master, the Messenger of God, is sent to Earth with a special mission. He is to reveal the Truth to humanity. Only he who has no violence in him can be a true Master in the world. He is strong but he never preaches violence. This volume is a treasure house of Wisdom, Truth and Divine Love. I urge you to read and contemplate these simple yet profound principles. I feel a deep almost celestial bond with this great man who so impacted our world. I feel his guidance, I experience his presence, even as I sit here writing this brief foreword to this amazing collection of transformative vignettes offered to us by one of the truly great Masters to ever walk among us. He has been instrumental in helping me to understand my own teachings over the last four decades, and in assisting me to become that New Man he envisioned throughout his entire lifetime. I am deeply honoured to put my name on the foreword to this book, and to have been a student of this Master. "Love is the only power in which burning does not leave any ashes or smoke. It is the only power in the world that does not produce any negative results."